Three steps on the road to total relaxation. Dive into the water and sauna world of the Römerhof swimming and spa area and fully recharge your batteries. After a busy day of hiking or skiing in the Gastein Valley, there is nothing more wonderful than relaxing in the warm waters of the whirlpool or taking a few laps in the mood-lit pool. Avid swimmers will appreciate the built-in counter-current area, which makes your training session a true pleasure. Our magnificent sauna area promises deep relaxation in our Finnish sauna, bio sauna, infrared sauna and herbal steam room. With different temperatures and humidity, the sauna world has the right offer for sensitive natures as well as for experienced sauna visitors. A highlight in winter - get your circulation and metabolism going with a soothing, warm session in the sauna followed by a cooling dip in the pool. Your immune system will also thank you for this hot and cold experience! Take a rest on comfortable lounge chairs in the quiet areas of Hotel Römerhof’s spa area. Here you can experience undisturbed sauna or spa treatments for yourself and your senses. 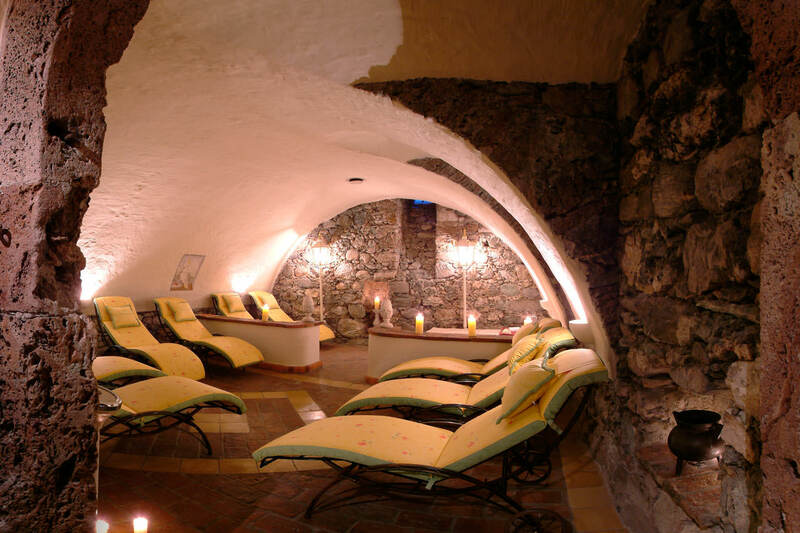 A special highlight is the quiet area in the heart of the old "Römerturm" Roman tower : the medieval vaulted room with walls made of ancient stones glows in the light of candles and indirect lighting to give your mind the perfect location to unwind. After sports and simply to relax, a massage is the right thing. Our trained masseurs pamper you with classic massages or sensually tempting ALPIENNE massages with natural oils and creams. High-quality care is also used in our cosmetic treatments. Let yourself be pampered from head to toe by our cosmetician. Fill up your energy reserves for the next day of your holidays in the spa area of your hotel in the Gastein Valley! In our spa oasis you can dedicate yourself fully to recreation and relaxation. To make a reservation for your holidays at the 4-star Landhotel Römerhof, do not hesitate to send a no-obligation enquiry to the team!